If life gives you basil, make pesto! | When I Survey . . . If life gives you basil, make pesto! We had about as perfect a day as we ever get here in the Berkshires. Not too hot, not too cold, not humid, not windy, lots of sunshine and birdsong, and to top it all off, my little herb garden was yielding the first crop of basil. Welcome summer! I have made more than my share of pesto in a variety of ways, and they all taste pretty great. The key is fresh basil and good olive oil and cheese. Here’s my basic recipe, which works with a pound of pasta. I have used many different pasta shapes. 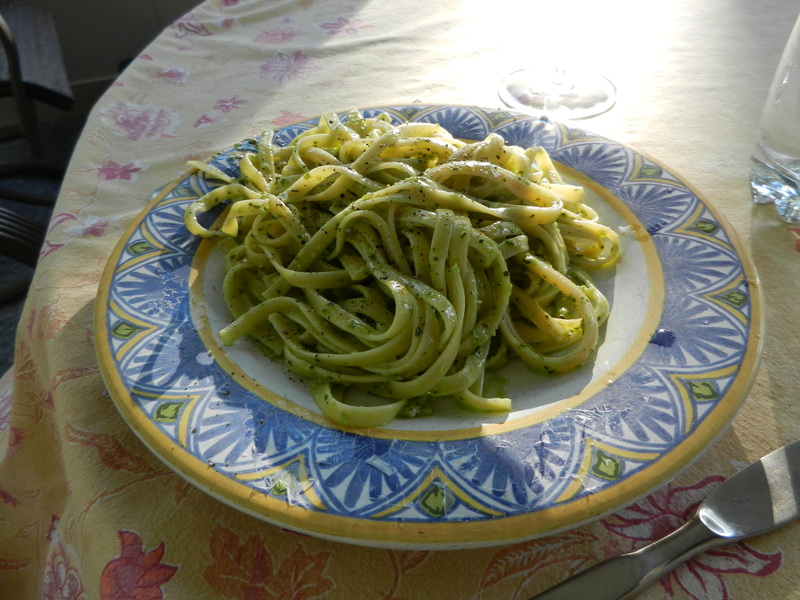 My favorite is fettuccine, which I have learned is traditional in Genoa, where pesto originates (they call it trenette there). Meanwhile, put the first 5 ingredients in the food processor and puree them. Pour them into a large bowl and add the two grated cheeses, blending them with a wooden spoon. As you cook the pasta save a few TBS of the cooking water and use it to thin out the pesto. Toss it all together and grind some black pepper on it. If you want to get fancy throw 1 or 2 TBS of softened butter into it just before you serve it. Any crisp dry white wine will taste great with it. We had an Argentinian Sauvignon Blanc with it tonight, because that was what was in the fridge. Enjoy! Perfect, and that not least because of its unpretentious simplicity. I was just thinking that it’s been a while since Rick (or Goroncy for tht matter) posted a recipe. Thanks mate. I’m just cooking up a pot of my Sri Lankan Beef Curry (http://jasongoroncy.com/2013/07/02/sri-lankan-beef-curry). These are signs of health, when we take a break from the tasks of disputation and elucidation and put out some recipes! Rick, in a moment of weakness, or inspiration, I bought a small container of pesto. Do you have any idea what I could do with it? How long it lasts once open? thanks, Dave. Hi Dave. Toss it with your favorite cooked pasta while the pasta is still hot. Pour a glass of white wine, add a salad, and you’ve got dinner. If it’s a small container use it all at once. I wouldn’t store it for more than a week once opened.